Sputtered as gains in the US were offset by OPEC cuts. At the December meeting, OPEC+ reached an agreement to reduce output by 1.2 million barrels per day (mbpd) with the largest cuts from Saudi Arabia (250,000 bpd) and Russia (230,000 bpd). OPEC granted exemptions to Iran, Libya and Venezuela, which had argued to be left out of the cuts due to their economic troubles. Russia waffled on when they would start their reductions as December’s production reportedly was a new high at 11.45 mbpd – +4.5% year-on-year and a record 11.16 mbpd average for all of 2018. However, OPEC output fell 0.8 mbpd to 32.4 mbpd in December, led by a 0.4 mbpd drop from Saudi Arabia. The kingdom announced a desired return to $80 a barrel oil to cover a massive government spending boost. In particular, it plans to increase state spending by 7% in 2019 in an effort to spur economic growth—a budget that requires oil prices to rise by $30 a barrel. To engineer this, Riyadh announced plans to reduce its crude exports by as much as 800,000 barrels a day from November levels, well beyond the commitments it made last month to OPEC. Nigeria started a deep-water offshore field, pushing December output to 2.1 mbpd, above the OPEC quota level of 1.7 mbpd that was set in the recent output agreement. Iraqi crude oil exports continued to recover, moving from 3.4 to 3.7 mbpd. Key talks to expand southern production and export facilities with Exxon and China National Petroleum made a move forward and hold promise for a long-awaited deal in early 2019. In an unsurprising reversal from the previous administration, Mexican President Obrador announced that foreign investors will be barred from refinery, rail and port projects. He needs to complete these improvements to achieve his goal to expand the government’s economic role as Mexico is dependent on US gasoline imports. Despite being home to the world’s biggest crude reserves, Venezuela exported 1.2 mbpd last year, the lowest since 1990 due to US financial sanctions, defaults on debts and a crashed socialist economy. The country juggled debts and lawsuits, paying $425 million in late November as the first third of an arbitration award for nationalizing a gold mine from a Canadian company back in 2011 with the rest due by 2021. We shall see if the rest of the $1.2 billion gets paid. Stayed within the 11.6 to 11.7 mbpd in December, the U.S. Energy Information Administration (EIA) said. During 2018, U.S. crude oil, natural gas and natural gas liquid production hit new all-time highs almost every month. Oil production grew by a staggering 1.7 mbpd from January to December, an increase of about 18% versus the previous year. Natural gas production zoomed skyward by 10 BCF per day, a gain of about 13%. The US oil-drilling rig count was basically unchanged from 887 rigs on November 30th to 885 rigs on December 28th. 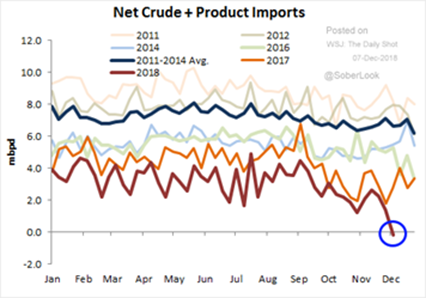 Exports continued to grow, with US exports of crude oil and petroleum products reaching a new record high of 8.0 mbpd in October. The net export numbers show to the left that the US has crossed over into surplus, at least on a temporary basis! The EIA reaffirmed that US oil production from seven major U.S. shale basins is expected to surpass 8.0 mbpd by the end of the year. 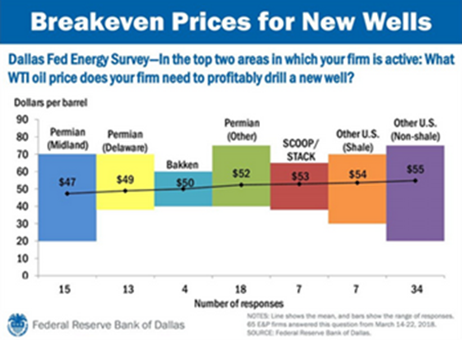 As the graph on the right indicates, US oil has been generally profitable in today’s price range, and if OPEC+ is successful in cutting production and raising prices, it will continue to be. In short, the US can profit from the ongoing oil market shenanigans. Resumed in early January with planned meetings both in the US and China. Before the US deputy trade representative arrived in Beijing on January 7th, China had made some conciliatory moves, cutting tariffs on imported US automobiles from 40% to 15% as well as purchasing US commodities it needs such as crude oil (three tankers carrying 3.9 million barrels are on route already) and soybeans (a relatively modest 1.13 million tons, a figure that farmers and grain traders said was not large enough on its own to lift slumping prices or absorb a huge surplus that has accumulated across the farm belt). Current soy stockpiles are roughly 2.5x to 5x more than normal so there is plenty to be shipped! Customs duties collected have doubled in the last twelve months (see right) so the US government is generating some extra revenue at least over this pressure to level the playing field with regards to intellectual property (which we believe is the true battlefield in these negotiations). 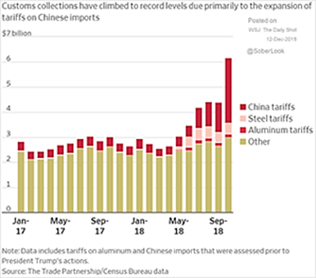 Without a resumption of trade, both countries will be worse off, but as shown in previous commentaries, the Chinese have been taking the brunt of the tariffs imposed so far. Included Germany’s last coal mine was shut down, ending a 200-year industrial core that fueled the country’s unification in the 1870s, two world wars and post-war recovery. Local utilities will still burn coal, but it will be imported, primarily from Russia, the US and Columbia. 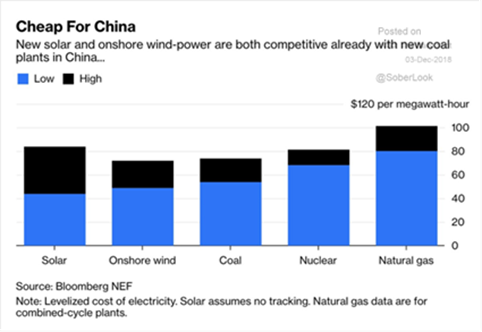 Coal also is finding new competition from new solar and wind plants in China (see left). Similar relative figures were seen for India. Grain exports for Ukraine powered higher, rising to 23.1 million tonnes in the first half of the 2018/19 season from 20.7 million tonnes a season earlier and is on track to maintain the 18% year-on-year increase through the end of the season. Ukraine said in December it harvested a record 70.1 million tonnes of grain last year versus 61.3 million in 2017. In comparison, Russia harvested 112.8 million tonnes of grain after drying and cleaning in 2018, down -16.7% from 2017. Australia’s wheat production estimate was upgraded in December by INTL FCStone predicting a total crop of 16.87 million metric tons, up almost 3% from November. On the other hand, China, the world’s second-largest corn consumer, harvested the least amount of corn in four years after the government pushed farmers to cut acreage in a bid to reduce massive state stockpiles. Looking ahead for Europe, EU grain crops were projected to jump in 2019 with soft wheat, the main crop cultivated in the bloc, hitting a four-year high due mainly to a sharp rise in projected yields after a severe drought this year (Strategie Grains). With regards to the US, the University of Illinois’ crop projections again indicated a strong harvest and low grain prices. Given this year’s winter weather, we would add that soil moisture looks good enough at this time to produce such crops. The world has (and will have) plenty of grain.